My teachers are telling me that they love, love, love, this program. Even the little ones are using the vocabulary. I’m glad we said ‘Yes’ to cloud9. Thank you. Thank you. We are truly enjoying the 21st Century curriculum! The curriculum goes more in depth and allows all of the students in our school to participate and gain a deeper understanding of these valuable traits that will serve them well as citizens of our community and citizens of the world. We feel so blessed to have the opportunity to provide the Cloud9World curriculum to the students and families of St. Agnes Academy. Cloud 9 World is truly a significant tool in the character building and formation of our community (at St. Stephen’s). We are on our 2nd year using C9W and you can see the impact in our students, teachers and parents. From the excitement and anticipation of discovering which character trait we will have for the month, to the different ways we can find a particular ending to the middle school vinyets; C9W provides hands on opportunities to learn, affirm and celebrate the importance of character building in the lives of our students. As part of our Episcopal identity, we like to lift up and celebrate the values and standards that help a community grow in witness, hospitality and love. This is when, in combination and as an addition to the wisdom in Scriptures, C9W offers phenomenal stories that help bring light to these important values and we like to integrate those together. One of the ways we use C9W, in the classroom is by asking our students with which character the students want to work on or bring as they work with a particular project. Sometimes they want to bring more cooperation. Other times they want to persevere, whereas other times, they want to show more courage. In our innovation class, our students have an opportunity to be creative and allow these character traits serve as guiders and motivators to accomplish their goals. We are grateful for the ways C9W helps us grow and live out our identity and purpose and we look forward to many years of mutual growth and transformation! 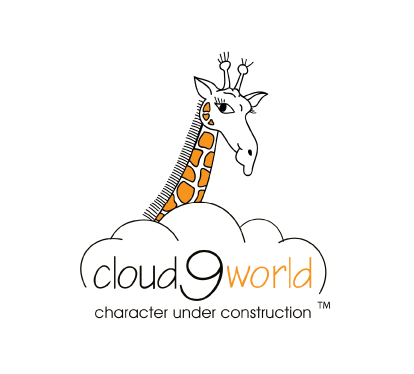 "The Cloud9World character trait program is a huge success at my school. We start and end the school day with me asking, "the word is?" and the students answer with the trait we are studying for that month. We have inculcated the program into our social studies classes. Each class watches the video, reads the book in class, and is read to by the teacher, for at least a week before it is sent home. The students discuss the meaning of the word and are required to give an explanation of the trait on demand from me after the second week of the month. The posters hang in the classrooms and in the hallway. The banners hang inside each classroom and every adult in the building wears their badge everyday for the month. 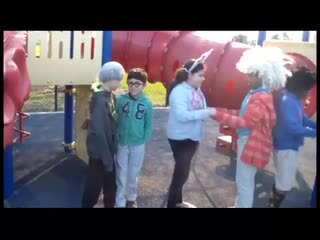 We have had some interesting situations with the students. Since it is expected for them to recognize the trait in each other when it is being presented, the students are also recognizing and calling out any adults that are not utilizing these virtues as well. One student told the daycare driver who was running very late and completely forgot her as part of the route, that she was not being responsible. The daycare worker complained to me about the child being disrespectful. 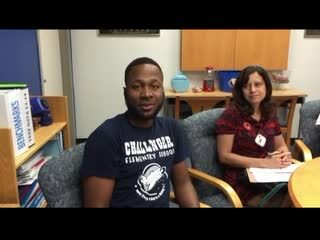 When I explained to the worker that the children are being taught character traits and it is up to the adults around them to not be "called out" by the children when they witness an adult lacking in the trait. A parent got mad because her daughter told her she had no self-control. I had to send out a note saying that the parents behavior was subject to being watched and they should behave accordingly. That do as I say and not as I do, does not work with children who are taught their virtues. One parent asked me not to teach anymore virtues, that their child is starting to see the parent's misbehaving and reminding them that they need to set an example. The children tell each other when they are not showing a trait and they applaud when someone is showing self-control, gratitude, respect and integrity. The students ages at my school are 3,4,5, and 6. This program was started because I was not seeing in my very young students the character traits we were taught as children from home, school and church. We required them to know right from wrong without telling/teaching/demonstrating to them what was right from wrong. My team and PTO decided to make this our responsibility. We could not assume that this was being taught anywhere else. The need to know how to live and get along with each other is our most basic need. The Golden Rule still rules. "The Cloud Nine series has been invaluable on our campus. The stories are timely and serve to open a dialogue to get to know my students. We have assigned a lesson per month, in order to see all the students. The program has definitely helped with our school climate. For instance, I have referenced various lessons when students have gotten in trouble. It has been helpful also to review what the students have learned so far, and they have surprised me with what they remember from the stories and how they are applying that knowledge." Our school district Has been more than pleased with Cloud 9 World. Our students are excited to learn a new character trait for the month. They are engaged in the videos and are able to understand a deeper meaning of each trait. I love that the program offers such amazing ideas on how to implement these traits into the classroom. It does not provide any extra work for the teachers because they are able to use the provided resources given to them through Cloud 9. The teachers love wearing a badge with the character trait on it in order to reinforce to the students everyday effectively. We love Cloud 9 world and are so happy we made this purchase for our students and school. "Crockett ISD loves the Cloud9 curriculum. We chose this curriculum due to the ease of implementation for our campus counselors and classroom teachers. The lesson plans and literature are perfect for the grade levels they address. The diversity of the program allows other content areas to be explored and the students love practicing the character traits they are taught through the Cloud 9 program. Besides the ease of implementation, we specifically chose Cloud 9 because it is a literacy based character education program. We have seen improved reading skills among our students, as well as interest in reading, all the while learning to be the best person they can be. Thank you Cloud 9."